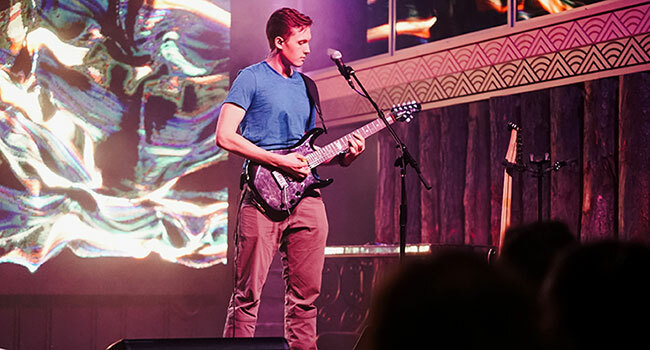 Nashville is synonymous for country music with some rock roots, but Music City native Gavin Kennedy is changing the landscape with his progressive rock sound. The multi-instrumentalist, composer and producer just released his debut album, Sunchaser, on February 9th via Faring West Records. He co-produced the eleven track fully instrumental project with Adam “Nolly” Getgood, who’s most known as the bassist for the metal band Periphery. The pair recorded Sunchaser in Nolly’s home country of the United Kingdom, but I chatted exclusively with both of them during a media event last week in Nashville. You are living in a city that has grown more diverse over the years, but is predominately a country music town. Your album contains polyrhythms and technical proficiency all around. Tell us how you draw inspiration. Gavin Kennedy: You know, Nashville has definitely grown and just become this huge ecosystem for music over the past few years. It’s definitely such an inspiring and fortunate thing for me to have a diverse community of musicians where really anything you want to hear, you can seek out and find. There’s definitely just an abundance of creativity here and it’s kinda hard not to want to draw something from it and be inspired by it. Please tell us about your debut project. GK: The album is called Sunchaser, and really it started off with me just kinda doing demos out of my bedroom just for the sake of doing demos. I guess I kinda had the idea to hone my production skills or really kinda see what my benchmark was in terms of writing. That actually started about five years ago so it’s been a super long time in the making. Actually within the last couple of years is when I first met Nolly and we began to work on it, and really, once that happened, just this huge level of professionalism and polish got injected into the project that completely transformed it to me and really took it to a place I couldn’t take it by myself. Probably a couple of years ago is when it first became something with intention and since then, it’s been this exploration of music for the sake of music. All the writing was predominately done by me, like ninety-nine percent of it. I was able to get together some fairly complete demos before I reached out to Nolly about the project. Actually, in the little pre-production phase we actually did before I journeyed out to England to record the songs, I would send Nolly the demos and he would give me a bit of critique on the structural changes and really just tightening up some loose ends that made a huge difference in the long run, but in terms of the composition and writing, it was pretty much done by me. How did the two of you meet and become co-producers? GK: We actually met in the fall of 2016. Nolly was working on a session with a band called Teller at the time. Really, when we first met, we just kinda had really good chemistry as friends and we got to know each other pretty well, and it was kinda after that I suggested doing something professionally together. I think kinda at that time, we were comfortable with each other to know it was going to be a really enjoyable experience and weren’t going to be very many speed bumps. In hindsight, there weren’t really at all. Really, I just wanted to spend some time with Nolly, just kinda observe some of his techniques. It was just a really great experience. It was very much kinda fly on the wall thing for me. I didn’t really have much of a say in any of the final outcome of the Teller sessions, but just to be with Nolly, you know, even with simple conversation, there’s just kinda an overwhelming wisdom that radiates to learn from. Nolly: We had Gavin out for our session. It was very nice. He was a very easygoing guy. It can be a bit of an imposition sometimes having somebody setting in on a session, but in this case, actually Gavin added a lot in terms of his vibe and his positives, so it was a bit of a no brainer when he asked me if I’d be interested in working on his record. That starts off the process of communicating internationally over email up until his first session on the record. The record was actually done in pretty order, I’d say. GK: Yeah, yeah, that’s true. “An Ecology” is a three part epic that spans nearly 18 minutes in total. It shows the self-discovery throughout your musical journey. Can you explain that a bit more? GK: “An Ecology” is actually the very first song that was written. One of the main themes out of it was the first melody that I ever tried to write, and really when I started creating that song, I just wanted to, like I said earlier, find my benchmark for what I could do whether it be structurally or melodically or some parts, technicality kinda thing. Really, that song for me, I wanted to encompass most of the things I love about music which is partly maybe why it’s such a long song. I really just wanted it to be just its own little, I don’t know, ecology, a study of everything I like about music. I’m really happy how it came out. The production was done a bit differently than most sessions these days. You didn’t use any programming, which I thank you both for not using, and the equipment used was a quieter technique using amp heads and virtual devices. GK: Yeah, we actually did most of the guitar and bass tracking out of Nolly’s home studio. I was fortunate enough to use his guitar collection which is pretty extensively awesome. Nolly actually kinda experimented with this kinda silent recording technique using real amp heads and a reactive load box device. Nolly: Yeah, it’s a good way of recording, especially for learning as much as you can apart from the blaring amp heads — it’s pretty useful. The way I like to record is to typically do things in the most comfortable fashion possible. Me being able to work out of a comfortable home studio makes quite a bit difference there, makes me a lot more comfortable, makes plans a lot more comfortable, too. When it came to doing the drums, we kinda have to do it properly. We went to a beautiful standing live room, hired the best drummer I know. If you want to talk about keeping things real, the drum performances are largely unedited. There’s no sample replacement on there which is kind of a feat which is largely due to how amazing job [former British progressive metal band Monuments drummer] Mike [Malyan] did as the drummer. Some of your music has already been played during defensive plays at Tennessee Titans games and during some of their playoff commercials. How did that come about? GK: That was a really really fortunate opportunity for us. We reached out just about instrumental music placement — the album is entirely instrumental — it seems naturally kind of a good suit for that thing, and we were really lucky enough to find a spot. I played the All Access show for the Titans so it was a pretty good chunk of the music too, so being able to see that was a really awesome thing. Lastly, album cover was created by Dan Mumford, who is best known for his artwork in Star Wars Episode VIII: The Last Jedi and Harry Potter and The Prisoner of Azkaban. Tell us how you recruited Dan to design it. GK: That was actually another blessing because really we didn’t have a connection of any sort. It was mainly just my mother actually — [She] has been kind of a super manager and she’s definitely had a challenge to pull some strings that normally aren’t pulled. We were able to get a hold of him, and fortunately for us, he was interested in doing it. We didn’t want to give him a ton of restrictions or guidelines to go by, and what ended up being the cover was a very intuitive interpretation of music on his part. As soon as we saw the first sketch, we had felt like we hit the bullseye from day one. That was another painless process. Sunchaser is available wherever digital music is sold, including Amazon and iTunes. Bass Player Magazine profiled Kennedy and a fifteen minute documentary “making of” Sunchaser.